Microphones are essential for part or all of our daily activities, depending on what we use them for. Given the various environments we require them for use, such as studios for recording our music or live events, we need to carefully select our picks. Some microphones are good for enclosed environments while others for open air. The source of your sound will also greatly determine your choice of microphone. It is advisable to select a microphone based on its intended role. And as we know it is hard to make the selection, we are simplifying it for you so you know which best microphone to buy under the $100 price. 1 How did we narrow down to the best microphone under $100? How did we narrow down to the best microphone under $100? There are several criteria we considered as we selected some among the best microphones under $100. These include the features of the microphones that we sampled and tested. Thorough research through reviews submitted by those who tried the mics out played a big part in our impartial determination of the best microphones. We have outlined the most important characteristics that you ought to consider as you shop for a microphone. And because we are after attaining the best sound quality while at the same time minding the size of our pockets, we compiled a list that is suits your needs. Understand the following first before settling on a brand or size of the microphone. We determined this final list by combining their greatest features and used those that made them outstanding in the selection process. We have outlined the variety of features that need to be considered when selecting a microphone. Which is the most important characteristic feature, however? What pattern will be captured depends on the directionality property of the microphone. How sensitive is your microphone? How efficiently does it pick up the sound from all directions? How efficiently does it eliminate unwanted noise? While some microphones pick sound from specific directions, others pick regardless of the direction. This leads us to the classification of microphones based on their directionality feature. An omnidirectional microphone receives sound signals regardless of the direction in equal measure. As much as it comes in handy in circumstances where the sound needs to be captured from all directions, it has a lesser degree of focus. Most of the time the sound is less clear. The indistinct nature of the sound means undesired sounds have overwhelmed the required sound. Bidirectional microphones receive the sound from two sides facing each other. For example, when people are at a conference table conversing, the microphone that is placed in between both sides at the table is bidirectional. A unidirectional microphone receives sound from one direction. It is specific like that. Most of the mics held in one hand are unidirectional. These are further classified into cardioid and hypercardioid mics. Cardioid mics pick most of their sounds from the front with less from the side. Hypercardioid mics, on the other hand, are more specific with picking the sounds from the front and eradicating the ones from the back or sides. With their specificity, unidirectional microphones require the sound to be steady from the user’s direction otherwise, it will be of no use. Depending on your kind of environment, you will need to choose a capture pattern that best suits your setting. Then the rest will follow. The size of the microphone’s diaphragm goes a long way in determining the kind of audio signals that will be produced. A larger mic diaphragm means two things; greater sound reception sensitivity and a larger output voltage. It also affects the rest of the microphone’s characteristics as is discussed in detail here. Larger diagrams allow for better capturing of the finer sound details because the vibrations of the sound waves are magnified according to their size. This gives them an upper hand over the smaller diaphragm mics as they produce stronger signals. A strong signal means a better noise handling capability and so the better option for you. This refers to the characteristic of a microphone that measures how it responds to different sound frequencies in a range. For general purposes, mics with equally flat responses are preferred. However, if looking for a custom-made sound for a specific purpose, it is wise to go for a personalized frequency response. A flat response means that the mic is almost similarly sensitive to all the range of frequencies. This is disadvantageous as the mic may end up processing all types of sound, including the undesirable and this means the resulting signal will be tainted. You will realize the importance of a tailored response in a case where the clarity of a person’s voice is needed despite the noises from the background. The aim is to target better production of the desirable signals. And there are mics designed to amplify the human voice and attenuate the unwanted noise. The vibrations produced by the sound that is to be converted into an electric signal are all passed through for the alteration. The microphone cannot comprehend what sound is desirable and which is undesirable. However, there are some microphones that have a protection system which enables the diaphragm to perceive what sound is desirable or not. They can also tell the unusual vibrations that are not required in the signal to be generated. They are normally given an upper hand. It is advisable to pick a mic that has a better noise handling capability so that the undesirable noise is filtered out. General electronics offer a certain resistance to the current that passes through them. For microphones, this current is the audio signal. Measured in Ohms, every microphone has its measure of impedance. Most cheap mics have high impedance but their downside is the poor performance when the conducting cables are stretched over long distances. Mics with low impedance are preferred as the audio signal faces less resistance and thereby better sound quality production. It is also notable to match the impedance of your microphone with the rest of the sound equipment. Be sure to check the exact impedance ratings of the mic and the rest of the components, from the manual or provider sites before making your order. This was a stiff competition as the mics we have listed all had their outstanding features. 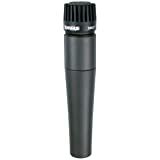 We however managed to settle on the Shure SM57-LC Cardioid Dynamic Microphone for its overall performance. This was our top pick. The Shure SM57-LC has a wide range of frequency response from 40 up-to 15000 Hz. It has been used for a long time in the music industry. Many recording studios boast having recorded the best of sound qualities with the Shure SM57. It is unidirectional and expresses the sounds of the instrumentals with precision. Professionals often recommend this because it complements a variety of music instruments such as drums and guitar amplifiers. Its cardioid capture response pattern feature eliminates the noise in the background, giving a boost to its otherwise flat frequency response. It transparently reveals the beauty of the singer’s voice. The sound pickup is from one specific point of focus. Its robust build enables it to withstand drops from heights of up to 10ft. And not only once, if the mic happens to fall on the floor severally, it can still withstand the effect of the drop. This makes it suitable for outdoor recording activities. The Shure SM57 is adaptable to various sound pressure levels. It can withstand high SPL with the least distortion making it suitable for instruments that have a high-volume recording. Drums sound best with this model of this mic. It can even handle what is screaming to the human ear comfortably. The SM57 can withstand a wide range of frequencies because of its non-specific tuning ability. It is perfect for artists who would their voices input raw. Those looking to record for their podcasts online or auditions will find this very ideal to them. Given its wide range of applications for different recording settings, it qualified to be our top pick. Just because the rest of the four microphones didn’t make it to the top pick doesn’t mean they are not good. Each of them has a specific area of strength that you could opt for based on your personal preferences. This particular Behringer has a gold coating and is a cheaper alternative to its brother the B-2 pro which has a polar multipattern. The B-1 is of cardioid pattern and this means two things. It is able to pick up the desirable sounds and isolate them from the undesired as well as reject any unsolicited feedback. It has a controllable low-frequency roll-off setting that requires no extra EQ settings. 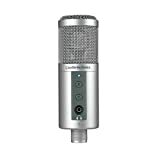 Singers who like to record at the comfort of their homes will find this very ideal for their daily sound recordings. It produces sounds with heightened practicality and sensitivity. The distinct presence boost feature present in the B-1 enhances the wide range of frequencies supported by the mic. It has an outstanding transducer that eliminates noise from the channel for enhanced sound clarity. This means it can also be used in different recording settings. If you are looking for a durable mic, the B-1 is the perfect choice for you. It can withstand the extended hours of recording sessions and comes in a well-crafted case that is easy to carry around. Whether you are looking to record live or in your studio, the Behringer B-1 is the ideal choice. There have been complaints of its excessively high gain, but this can be fixed by tuning the amplifier down to prevent chances of a feedback occurrence. It supports input attenuation. Overall, however, this is a really great mic for your vocals at the most affordable price. This is a quality mic for self-recording artists looking for a budget-friendly pick. Many musicians who are new to the music industry have had a great experience with the MXL 770, both for the price range and the sound output quality too. It offers a classy look and boasts its compact bass. The microphone comes with a case designed to withstand any brute external forces providing it with enough shield. It also comes The bass is ideal for the rap music genre. The top end of the Cardioid condenser provides an added clarity resulting in a warmer sound. All you have to do is let the mic warm up to the surrounding then you will get the best of sound qualities. The MXL 770 has been rated as having one of the best price-to-performance relations. The microphone comes with a case designed to withstand any brute external forces providing it with enough shield. It also comes armed with a cool looking shock guard that ensures the mic’s solidity. It has a large diaphragm which guarantees audio production of pure studio-quality and includes both high and low-end frequencies. Artists seeking to record from their studios at home will find this item very ideal for them. It also complements other applications such as VoIP, Skype, and FaceTime that are used for podcasting and recording vocals. It is simple to use as there are no drivers required for it to work. All you have to do is plug and play. Since most people recording from home use their PCs, the C01U is well-suited for the computer’s digital audio recording. The Samson C01U condenser mic has an upper hand over its predecessor as it comes with a headphone output which enables you to record as you monitor the progress with zero-latency. Its peak LED indicator which tries to match the integrations that the home PC based studios come with. The Samson C01U accommodates mobile phone recording applications. Its solid metal construction together with the hefty gauge mesh grill is a boost to its durability. It comes with an ideal stand for the desktop setup. However, there have been complaints of difficulty in setting up the mic but the manual that comes with it can help in this case. If you are looking to record for a podcast, home studio, for voiceover or in the field, the ATR2500 condenser mic is ideal for you. It is plug and play and will work naturally with your computer’s software. It has a large diaphragm and cardioid polar pattern to reduce incorporation of undesirable sounds. The built-in headphone is for better control and monitoring of your mic’s volume sounds during recording. The Audio-Technica ATR2500 is accessorized with either threaded or tripod desk stands to hold and balance the mic. The diaphragm is light to boost its frequency response ability. It is easy to set up this mic. It is not perfect but just like the rest it has its flaws. It is a good option as it is affordable for the price range. The specs of a mic don’t tell you everything you need to know. The performance of the mic is also influenced by other factors such as the type of material used to make it and the overall structure. The only sure way of telling how good a mic is by listening and that is why we took the time to test samples of the mentioned to ensure you get the best suited mic for you. We check out the Best Microphones under $100, rated on a number of important features such as capture response and noise cancellation.